Anyone who knows me knows my obsessive love for Woodways; I call them my babies. I think I have such affection for them because they have treated me so well over the years. And trust me, I was a bit of a skeptic at first. During my first coaching stint at Cal-Berkeley, my boss/head coach Tony Sandoval (a master of developing speed in distance runners) used Woodways for individualizing workouts during track season. Most athletes had 1-2 interval workouts a week on Woodways. At first, this was a very unusual concept for me because I came from a program (like most others) where we ran as a team; same workout, same time, same place. Over my 3 years at Cal I witnessed how valuable Woodways were for improving performance; my final year we had 2 women run top-5 times in the country in the 3,000m and 5,000m and we qualified a Distance Medley Relay team to NCAAs. What I think was even more telling was that in previous years our top women had also been the most injury-prone. Training and using an incline on Woodways (compared to the track, hard dirt, or pavement) reduced a lot of the impact that previously led to bone injuries. 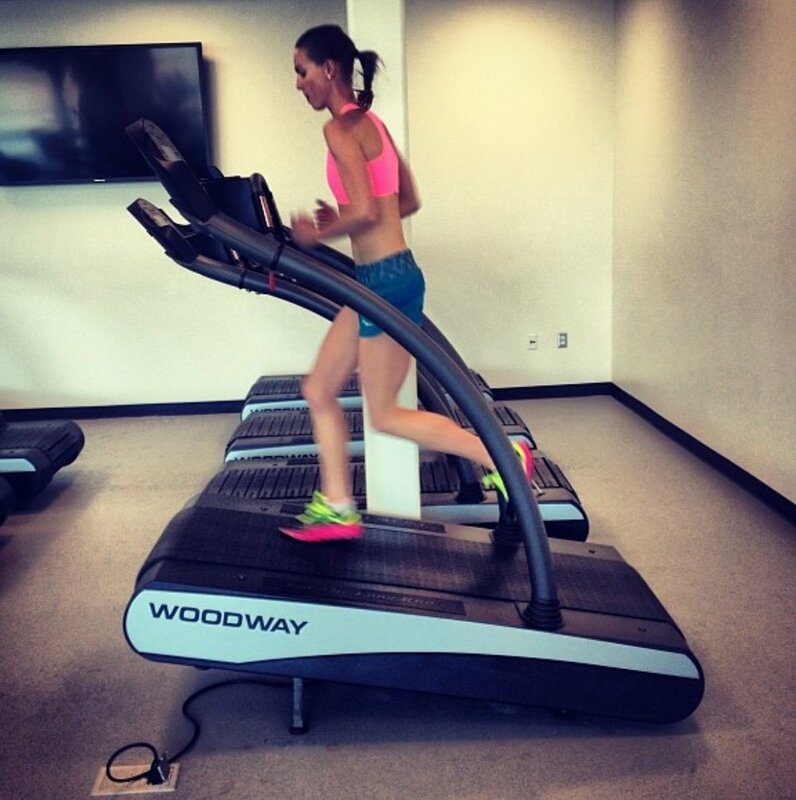 One of my former stud athletes at Cal, Chelsea Sodaro using the Woodway for incline work. Chelsea has personal bests of 4:30 in the mile, 8:47 for 3k, and 15:10 for 5k. After coaching at Cal, when I began to train and compete professionally again, I found myself using Woodways a lot. Compared to college, I was now trying to manage a whole new level of musculoskeletal issues and imbalances. I dealt with plantar fasciitis that seemed to get worse with monotonic running on flat land. I also had regular tightness in my left hip region that would cause me to feel flat, and at times cause extreme pain; I felt like the pain was exacerbated by repeated turns on the track. I grew to appreciate the reduced impact on my body and recognize the aerobic and muscular power I got from running at an incline on Woodways. I actually ran my PR in the mile (4:39) during this time in my career! Now, as a personal trainer and running coach, I am again seeing the huge benefits of Woodways with my clients. I can have runners of all fitness levels doing workouts right next to each other!! Having someone who runs 9-minute mile pace training next to someone who runs 6-minute mile pace cannot happen outside on a track! I think that’s my favorite part of our concept for a treadmill studio: no matter what your fitness level, you have a unique environment to train in with the resources and energy to make the most out of your fitness!